Our rating: three lava lamps. The producer's cut of Halloween: The Curse of Michael Myers is one of those legendary cult film items, like the alternate ending to Army of Darkness and the director's cut of Hard Target, that are usually sold by bootleggers at sci-fi conventions. In our review of the theatrical version of Halloween: The Curse of Michael Myers, we were pretty hard on the film, and the writing in particular. But the film's screenwriter, Daniel Farrands, was nice enough to send us a copy of the producer's cut of the film, on the grounds that it represents something closer to his vision of the movie. When we watched this earlier cut, we realized that in this form, Halloween: The Curse of Michael Myers could have been the best of the Halloween sequels to that date. Sadly, this movie was butchered before it hit theaters and became an incoherent mess. Fans of the Halloween franchise were robbed of a movie that could have rescued the series from its slide into stupidity. Instead, they were treated to a castrated story and an overdose of gore. In short, another dumb sequel. Instantly accentuating the differences between them, the two versions of the film have different onscreen titles. The theatrical version identifies itself as Halloween: The Curse of Michael Myers, while the producer's cut is Halloween 6: The Curse of Michael Myers, with the "a" in "Halloween" styled to look like the Thorn rune. Up to this point, both versions of the film are similar, at least in outline. The point where they diverge totally is at the fade to black following Kara's fall from a second-story window. This is at 1:07 (one hour, seven minutes) in the theatrical version, and at 1:20 in the producer's cut. Before that, the story is familiar. Jamie Strode (J.C. Brandy) escapes from a Druid cult called Thorn with her newborn baby. She is pursued by Michael Myers, apparently a disciple of Thorn, to Haddonfield, hiding her baby in a local bus depot before Michael catches up with her and nearly kills her. I'd rather die than do reshoots on this movie." 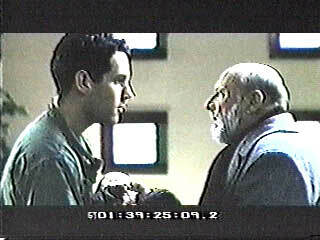 The baby is found by Tommy Doyle (Paul Rudd). Doyle was the kid Laurie Strode was baby-sitting in the original Halloween, and he is now Haddonfield's resident expert on Michael and his mystical background. Tommy takes the baby back to the boarding house where he lives, across the street from the Myers house. Living in the Myers house now is a new set of Strodes, including Kara and her illegitimate son Danny. Danny has been having disturbing visions that tell him to kill. This aspect of the story is never fully explored in either version of the film, although it does make some sense in the producer's cut as Danny's relationship to Michael is cleared up. A retired Sam Loomis (Donald Pleasence) is alerted to Myers' presence in town by the reappearance of Jamie, long thought dead. Along with a former colleague, Dr. Wynn (Mitch Ryan), Loomis begins to hunt Michael. On Halloween, Michael begins his killing spree, with the dual purpose of killing off anybody living in the Myers house and finding the lost baby. the loony bin is starting to look like a good option. The biggest plot change in the first part of the movie is that Jamie Strode is not killed by Michael in the barn. In the theatrical cut, Michael impales her on some sort motorized farming implement and then turns it on. Obviously, she dies. 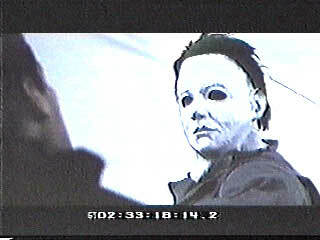 In the producer's cut, Michael stabs her from behind, largely off screen. She is taken to a local hospital, where she is later shot by the Man in Black (who rescued Michael from prison at the end of Halloween 5). The earlier portions of the film also reveal that the producer's cut has much less graphic violence that the theatrical cut. This greatly improves the movie, as Michael's use of farming implements and over-the-top killing methods was always a distraction for us in the theatrical cut. Perhaps the silliest moment of the theatrical cut was when Michael killed John Strode (Bradford English) by impaling him on a fuse box, and John's head exploded! Mercifully, he's just electrocuted in the earlier cut. While the theatrical version has more gore, and longer suspense scenes, it cuts large amounts of character and plot development that were present in the producer's cut. The worst examples of these cuts involve Loomis and Doyle. Most of Loomis' scenes are truncated, and we are given little exposition about his relationship with Dr. Wynn. 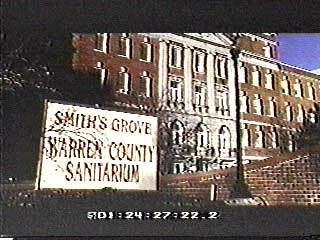 In the producer's cut we are given additional background, and there is a plot point involving Wynn's retirement and his desire to see Loomis replace him as the head of Smith's Grove Sanitarium. Because the film's biggest surprise (in either version) has to do with Wynn, it makes no sense to cut this material. Important info about Tommy Doyle is lost in the theatrical cut as well. In the producer's cut Doyle has figured out the significance of the Thorn rune, and he has a plan to use positive runes against the evil influence it represents. So long as you can keep your suspension of disbelief intact, these elements combine to form a somewhat logical plot. Scientologist anymore! Guys? Guys? Anybody?" After Kara's little experiment in jumping out of windows, the two versions diverge wildly. 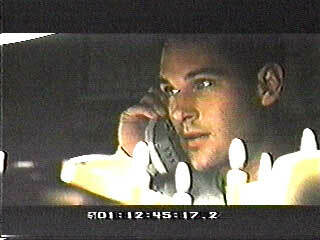 First, let's look at the version you would have seen in the theater (or on commercial tape). Kara wakes up in Smith's Grove, though why Wynn (the head of Thorn) would take her there is never explained. Loomis and Doyle follow, and end up getting separated. Loomis has a brief conversation with Wynn, and we find out that Wynn thinks that "Pure Evil" can isolated in Michael's DNA. Loomis is knocked out, and Doyle finds Kara. Doyle and Kara are then pursued by Michael. Our heroes escape Michael by hiding in a lab. Nearby, Wynn and some of his associates, who aren't druids after all, prepare to do some sort of genetic experiment involving the baby (and possibly Danny). Doyle and Kara rescue the kids during some confusion, and Michael kills all the doctors (huh?). A big chase scene follows with Michael in pursuit of our heroes, and it ends with Tommy beating Michael with a pipe. Tommy, Kara, Danny and the baby all escape, while Loomis stays inside to face Michael one last time. The producer's cut, on the other hand, features a more mystical turn of events. Kara is taken prisoner by Thorn because they want to turn Danny into another mindless killer like Michael, and they need her as a sacrifice to do that. Tommy, who arrives with Loomis, reasons that Michael's powers of invulnerability can be cancelled out by the magical runes that represent Good, and so he lays a trap for Michael while Loomis seeks out Wynn. It turns out that Wynn's retirement from Smith's Grove is also a retirement from his position as Michael's caretaker, and in a scene laced with much magic and hokum, Wynn passes on his duties to Loomis. Why Loomis is chosen isn't clear, especially since the good doctor is about three breaths away from kicking the bucket (Pleasence himself died before the film made it to theaters), but there you have it. The producer's cut also suggests that Michael has retired from the noble profession of serial killing. "I've got your runes right here!" 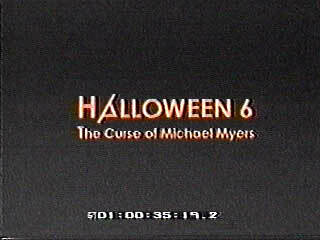 Why Halloween 6 was changed from its original form to the newer, less coherent one is a mystery to us. Because Pleasence was apparently unavailable for the reshoots, the changes have been made using some heavy-handed editing and the use of body doubles, which cripples the flow of the film and makes some conversations downright silly. The scientific aspects of the plot are never discussed beyond the point of a few dramatic closeups of some DNA diagrams, and the fact that little Tommy Doyle can beat the crap out of bogeyman Michael Myers with a lead pipe is beyond ludicrous. We were never happy with the Druidic plot elements introduced in Halloween 2, but at least the producer's cut of Halloween 6 deals with it. The theatrical cut inexplicably throws it out two thirds of the way through the film. Someone thought that extended gore and some haphazard plot twists coupled with an overlong chase scene would make up for the loss of character development in Halloween 6. That someone was wrong. We can almost console ourselves with the fact that we have now seen H6 in its intended form, and that Farrands had much better intentions for the next step in this wayward series than were allowed to appear on screen. Dare we hope for a Producer's Cut special edition on DVD? Only time will tell. Until then, haunt your local sci-fi conventions, because there are some lost horror film treasures worth digging up.